Derrion Albert’s walk home after school to his Chicago home was his final and fatal act. The dangerous path for Derrion, a 16-year-old honor student, was lined with brutal assassins whose fists and fury snatched his life. For Sherdavia Jenkins, 9, playtime resembled wartime. While playing with dolls on a summer day outside of her Miami home, a shootout erupted, a bullet from an AK-47 tore through her neck and killed her in 2006, weeks before she was to start the fourth grade. Earlier this month national leaders joined Derrion’s family at his funeral as Americans shared outrage over the boy’s videotaped beating death by a vicious mob. Days later, Sherdavia’s family was quietly comforted by the conviction of her killer. These disturbing losses of children spark anger and debate for a while. But later their deaths fade from the nation’s memory. As the nation’s attention turns to more exotic health threats such as the swine flu, the old problem of urban violence is being eclipsed again. Homicides of children, especially black youth such as Derrion and Sherdavia, is a serious health issue. Homicide is the No. 1 cause of death for black males ages 15 to 24, according to the Centers for Disease Control and Prevention. If this health crisis affected any other group there would be a strategy to prevent these deaths. Some neighborhoods across the country are like shooting galleries where children rush home in fear hoping to cheat death another day. Yet, killings of black children continue with no urgency for a real plan of action. Where is the hysteria over these homicides? We know that violence is wiping out children faster than any virus. Bullets, bats and bullies are serious, tangible, visible, immediate health threats to children. Yet the mysterious illnesses hold our attention. Attorney General Eric Holder and Secretary of Education Arne Duncan’s recent anti-violence meeting in Chicago is a hopeful sign. But their gesture feels familiar. 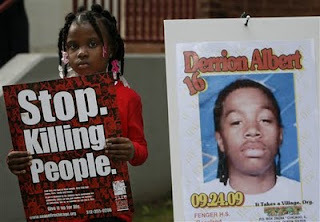 A child dies brutally, leaders and politicians visit the neighborhood and their promises of protection rarely follow. I can’t believe that the killing of her son and others have become so common that we seem to accept them as a normal part of American life.